﻿﻿"There's no place like home, there's no place like home, there's no place like home!" 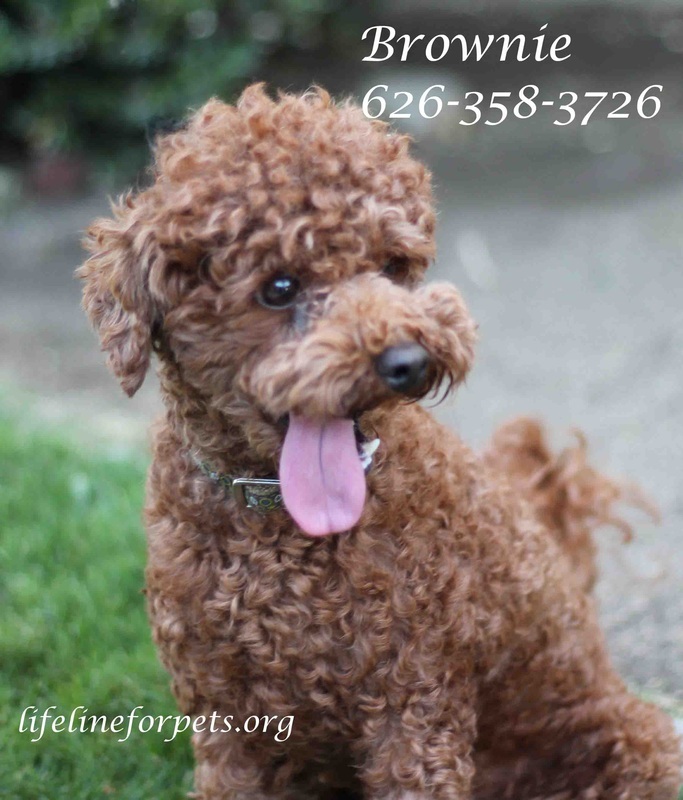 We hope you enjoy these true stories with happy or inspirational endings of Lifeline for Pet's rescued animals. Whatta boy!! This sweet stray was rescued by a good Samaritan because he was being tortured by peacocks and bullied by another cat. He was brought to safety and given a health exam, where it was determined he is FIV+. Norman, nee Rocky, is a big lug and a big love! He LOVES LOVES LOVES to be pet, held, & cuddled. 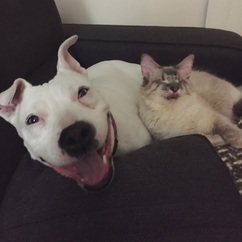 Norman gets along with everyone, including his new brother in his new home. 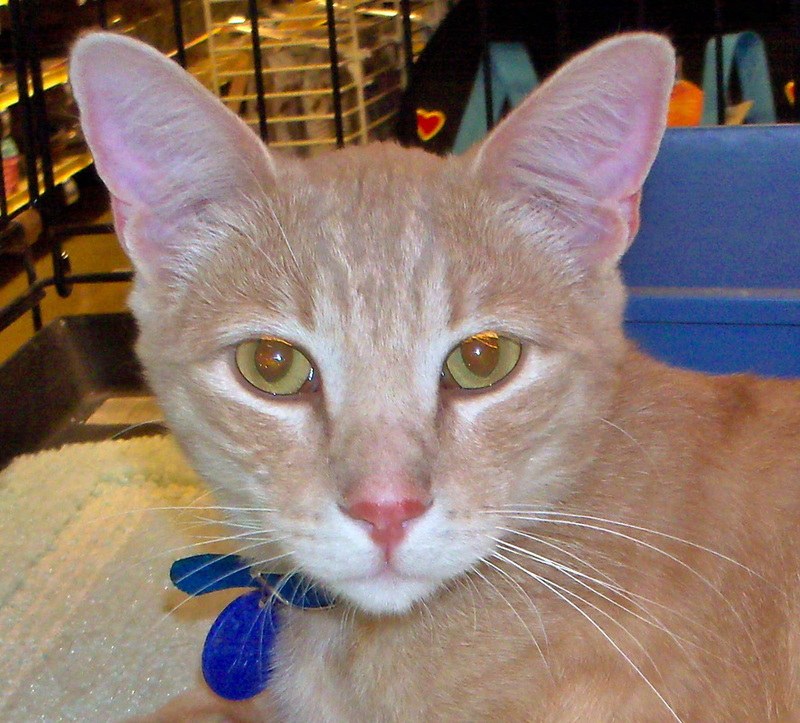 This sweet boy, who had never ever known a loving home, has a life of "purr" bliss at last! 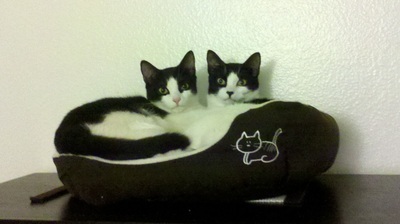 These two very bonded sisters had been in a loving home all their lives. When their owner passed away, and they came to us, they were confused and wondering why they were not at their home. Yet, they were still very sweet, friendly, and loving to everyone. Their new mom says, "Ava and Lola knew they were “home” the second I opened up their carriers, and they’ve been queens of my apartment ever since. Ava, although the smaller one, has enough sass for the both of them, and her sassy meows and conversation never fail to make me laugh. Lola loves to play, and when not playing, she is snuggled up on my lap. They both love to cuddle and sleep on my bed with me every night." My name is Isabelle and I am the luckiest kitty in the world! I was rescued by Lifeline for Pets after spending about a year on the street and I now have a forever home. While I was on the street I was a young mother but am now enjoying a loving home with good food and a loving environment. I am very thankful that Lifeline for Pets rescued me and took such good care of me and found me a good home. 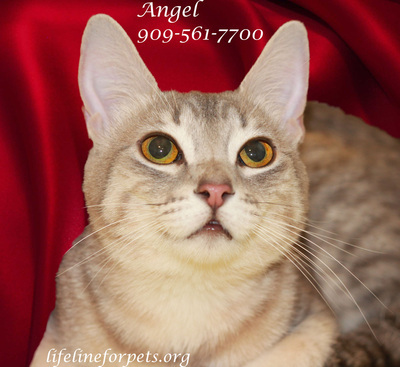 Please consider adopting one of my friends at the Lifeline for Pets cat pad. They are all very special kitties and like me they all need a good home. Stryder had a rough start in life. He was living in a feral colony, and at some point, he was trapped in a leg trap, which is illegal. By the time his feeder found him, his leg was terribly mangled and Lifeline was contacted for assistance. His leg had to be amputated & he tested positive for FIV. 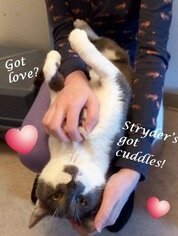 Once he was in our care, it was obvious, Stryder was not completely feral. We decided not to return him back to his colony so we found a foster home for him. 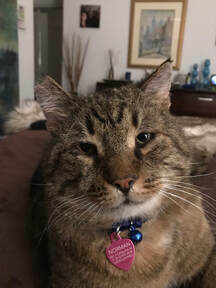 Once he was in a "home", he became very loving, loved to play, loved the comfort of a real bed and bonded with his foster Mom and trhe other house cat. Eventually he found his forever home and is living the life he deserves. Way to go, Stryder! Many adopters are happy with just an "only" cat. Yet, we are always promoting the benefits of adopting two cats, which more and more folks are doing; but . . . it is a rare occurrence, indeed, when 3 cats are adopted, and one that brings us much joy! (Note: We even had someone adopt 4 kittens!) 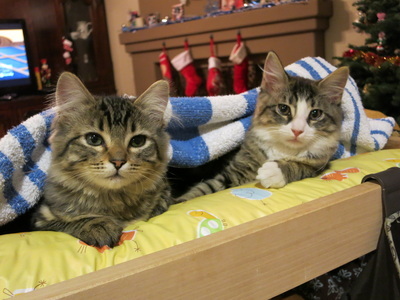 Such was the case of one amazing adoptive family who adopted 3 kittens from the same litter. What made this adoption even more special was that one kitten, Grover, only has one eye and is all black. That was 2 strikes against him, as all rescues know that a special needs animal, and a dark colored animal, are the hardest to get adopted. Of the other 2 kittens, Willow is also all black, and Pansy is black and white. This wonderful family often sends us updates and pictures. All 3 kittens are thriving! "Each is so special—Pansy, the intrepid explorer; Willow, the shy guardian; and Grover, who is adept at everything that any kitty with two eyes can do and then some. And they are all so sweet. 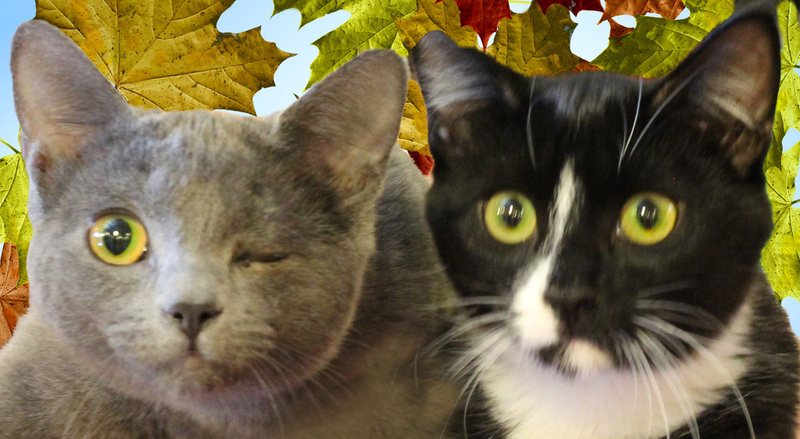 We couldn't hope for more purrfect companions. We can't thank you enough for rescuing them and all the others you've saved." 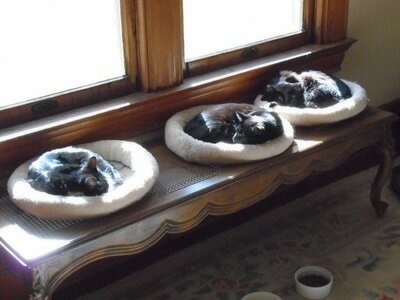 It was two years ago today that you brought Hawthorne (Grover), Daisy (Pansy), and Willow to us. They couldn’t have made us happier, and we hope they are happy, too. All three seem quite comfortable and content. Grover is still on medication for his asthma, but it seems to be under control; we are trying to reduce his daily dosage gradually. He is as adorable as ever. 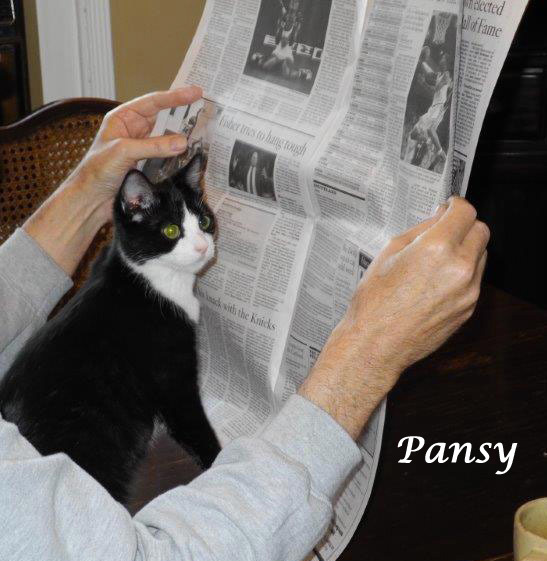 Pansy’s into everything but couldn’t be sweeter. Willow is a super sweet kitty, too. She gets her daily brushing, which she very much looks forward to. Although not as outgoing as Pansy or Grover, Willow likes attention and often asks for it, which she always gets. Thank you again for all the wonderful rescue work you do. 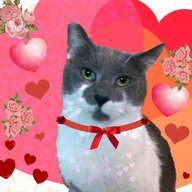 We've attached a few photos of our beloved kitties. They are all so sweet and good; we couldn't ask for more perfect companions. Grover's asthma is under control, and he got an A+ on his recent blood test. He always makes us smile. 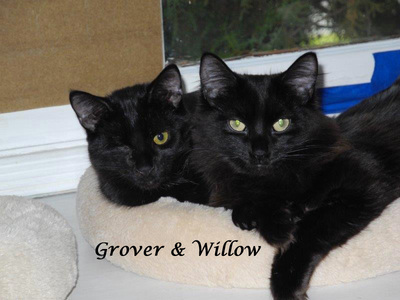 They all get along, although Grover and Willow seem to have a special bond. Willow has almost overcome her shyness with us. She will "call" for attention and always gets it. We take turns brushing her each night, which she particularly enjoys. It's her special time. Pansy's so bright and curious, and she couldn't be friendlier. We marvel daily at how lucky we are to have them in our lives. 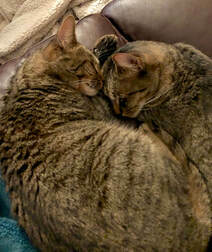 Thanks again for rescuing these wonderful felines and countless others. One of our terrific supporters, Betty, who adopted her 2 dogs from us over 15 years ago, had experienced a missing part of her heart after losing both Ra and Winter (see pic). Still, she had room in her heart to love another dog, and that lucky dog turned out to be Baxter. 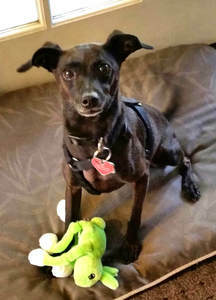 Baxter had been looking for a forever home for months, to no avail. 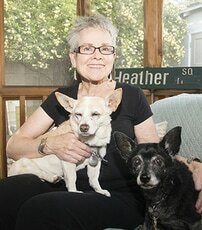 When our dog coordinator, Marilyn, mentioned him to Betty, it was meant to be! We can never replace the pets we've loved so dearly, but we have enough love to open our hearts and homes to another who needs us. We wish Betty and Baxter many happy years together. UPDATE: Baxter is a happy boy! When Lifeline heard that Ryan, a disabled veteran with PTSD needed to find a temporary home for his cat, George, we stepped in to help. The VA housing where Ryan lives allowed his dog, but not George. We did two email blasts and posted on FB. Many generous folks sent money to take care of any medical needs for George's future, and one amazing supporter offered to foster George unconditionally until Ryan can find housing that would allow him to keep George. Ryan, a very humble man, is so very grateful for everything. He is so relieved that he will not have to give up George, and will be able to visit him whenever he can. This is a picture of George's transfer from Ryan to the foster mom, Brenda. Thank you for your service to our country, Ryan, and our best wishes to all of you! UPDATE, Oct. 24, 2015: President Kathy Hart says, "I had the pleasure of meeting Ryan's Mom this past Friday. She was in town helping Ryan look for an apartment. 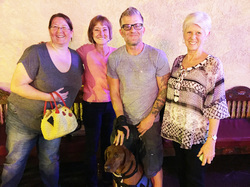 Brenda joined us also and we had a nice evening. Ryan hopes to move into his new place in November and George will be able to join him. Ryan got a doctor's note indicating that George, the cat, was a therapy animal; therefore, is allowed to have him in any living facility he's at. Brenda has been taking wonderful care of George. He's a lap cat, he loves treats (Ryan could never get George to eat treats!) and loves his cat buddies. Both Ryan and Paula (Mom) are forever grateful to Lifeline for helping Ryan." UPDATE, Nov. 18, 2015: GOOD NEWS! Ryan picked up George this week from Brenda! What a happy story! UPDATE, Feb. 22, 2017: Ryan, JJ, and George moved to Ft. Myers, FL and are doing well. 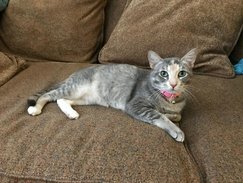 FIV+ Tabby finds forever home! 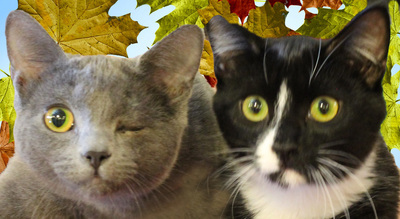 There must be extra special blessings for the wonderful, kind-hearted souls who adopt cats with special needs. Chip is FIV+, which is like human AIDS. It is only contagious to other cats, not humans or other species, and only if bitten drawing blood. 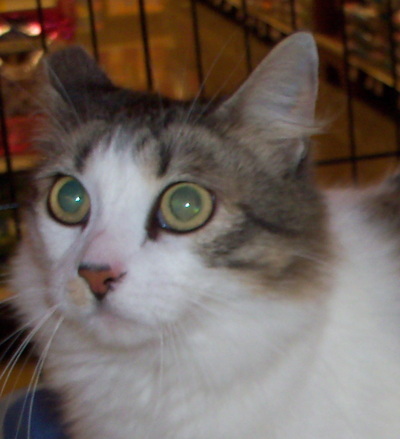 Yet, an FIV+ cat, if friendly, and kept indoors as the only cat, can live a normal, healthy life. Chip was SO FRIENDLY at adoptions, with people and other pets! This large, "muscle-man" of a cat, with cute "chipmunk cheeks," always attracted potential adopters. However, when they'd learn that he is FIV+, they would turn away. 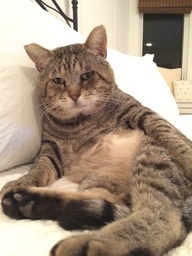 Cats with special needs, even EASY special needs like Chip, are always the hardest to be adopted. Finally, after many long months, a woman came forward. 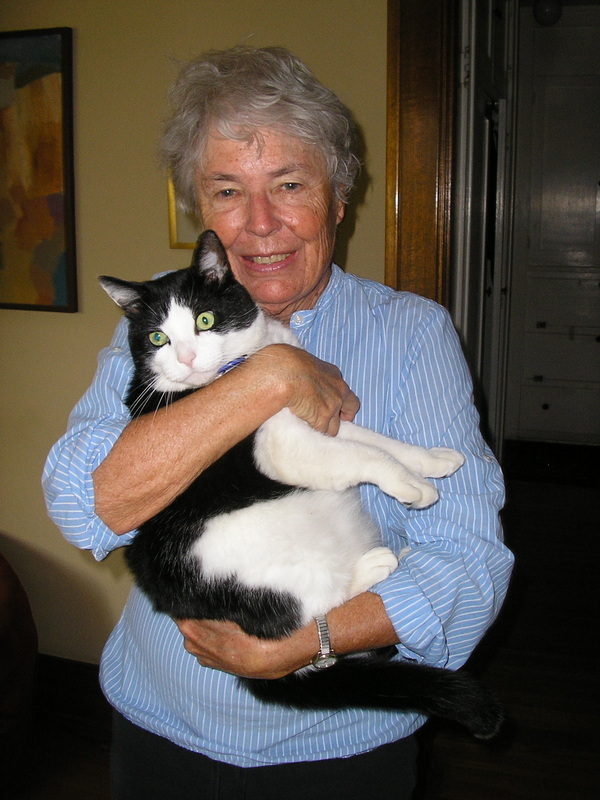 She had lost a previous FIV+ cat, and had seen Chip's adorable video on our site. She fell in love! 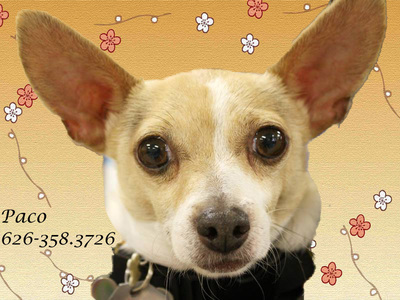 Chip now has a beautiful home, a loving owner, and a doggie pal! 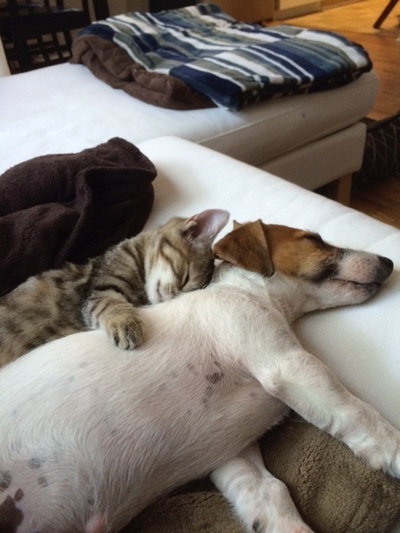 His owner says he is quite the cuddler. Rock on, Chippie!! Chip, just kicking back at home, and waiting for a belly rub! 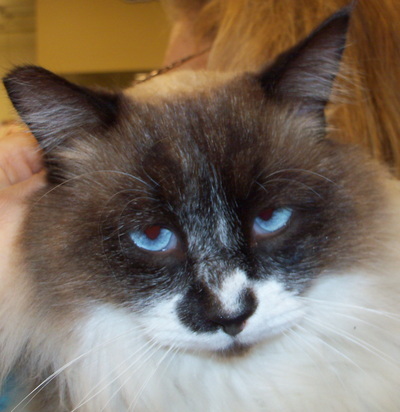 After having a loving home for many years, 15-year old Pyewacket, stunning Ragdoll, had to be rehomed. 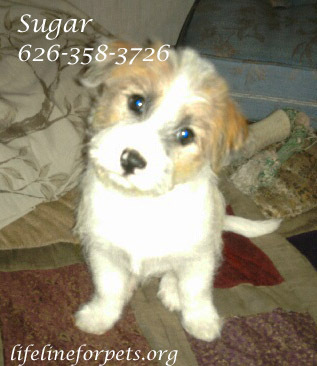 He was adopted twice, unsuccessfully, but through no fault of his own, because this sweet guy only wanted to be loved. Finally, our friends at Cats Pajamas took him in, and Lifeline stepped in to help. No sooner did we get his pictures and video on the websites, when a wonderful woman called. She said she wanted an older kitty, since she knows that the old ones are hardly ever adopted. We were just thrilled! He now rules the house and sleeps in one of his many beds--and that's just fine with her! When we found the abandoned basket of 6 kittens, we realized they were not in great shape. The health exam revealed that the two males had bad eye infections. 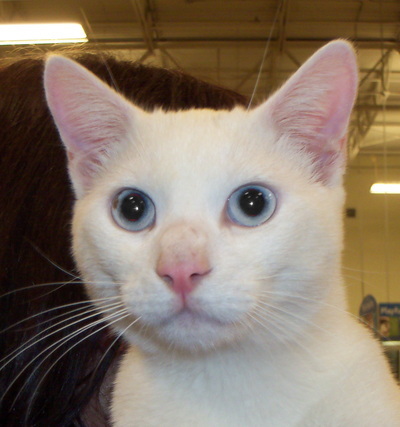 Hawthorne, all black, had to have one eye surgically removed, and little Larkspur, the flame point Siamese mix, was totally blind. 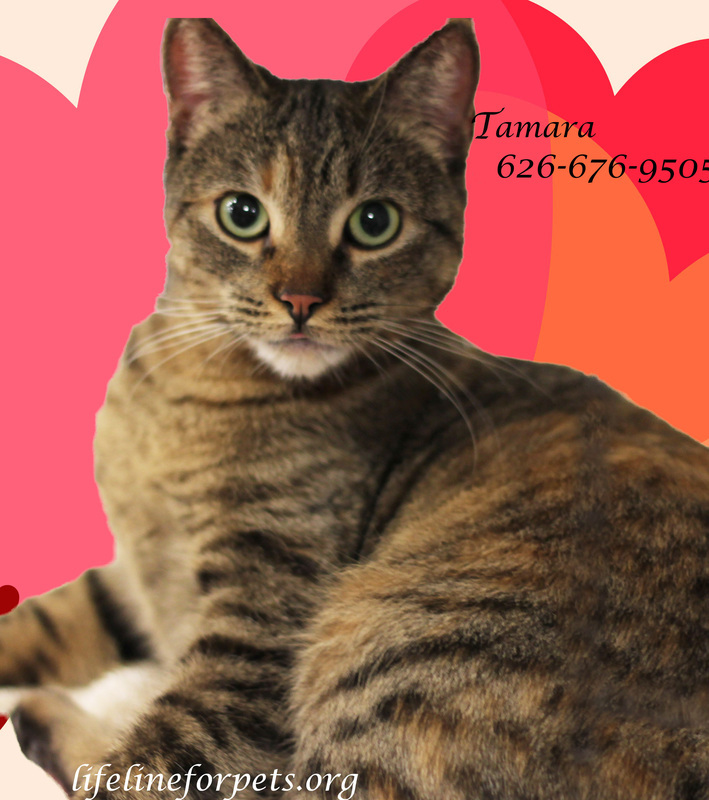 We worried that Larkspur would never be adopted, because most folks only want a "perfect" pet. We could tell that he was very smart, and didn't seem to know he couldn't "see," for his other senses were well-developed. 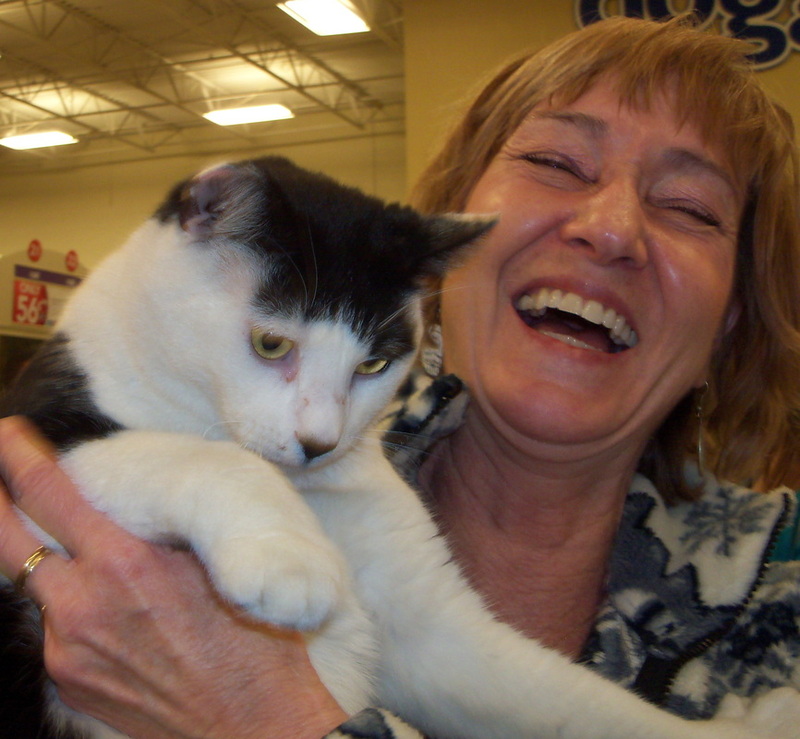 Then, on one of our adoption days at Pet Food Express, one of the employees there saw him and fell in love! 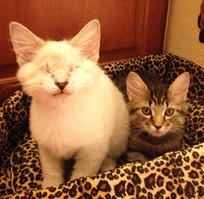 She has a soft spot for the special needs cats, and knows they are difficult to adopt out. She adopted both Larkspur and Poppy, his tabby sister. 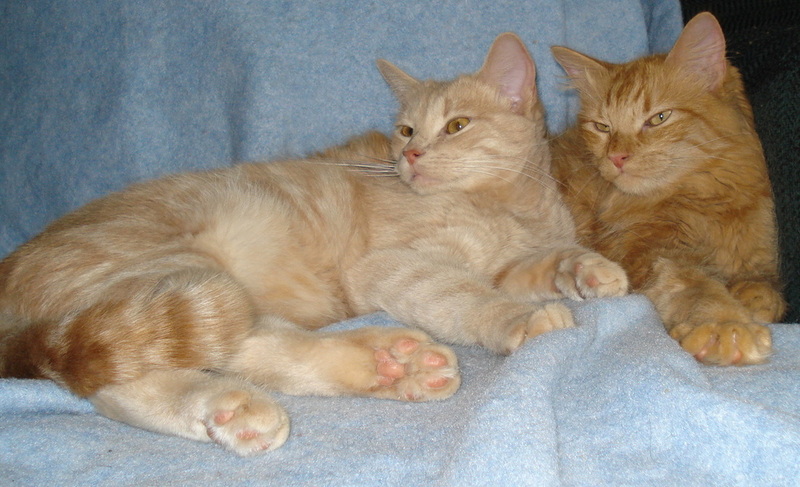 The two are devoted to each other, and Poppy (renamed Boo) helps Larkspur (renamed Sully). They put a little bell on Boo, and when Sully hears it, he runs to her. He plays like there's no tomorrow--no one told him he is blind! All 6 siblings have been adopted and are enjoying happy lives! Sully with his dog pal, Lotus, who is deaf. 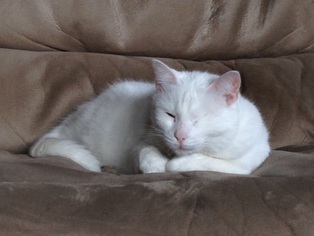 Beautiful, all white Blanca was rescued, crying from living on the streets around Rosemead Blvd. She was pretty young, but had already had a few litters of kittens, all who had disappeared, likely from coyotes, other predators, or just from the hard life. She was scared but submissive, and we knew she would eventually be adoptable. Blanca was soon pronounced healthy, except for an untreatable eye issue. Her eye had to be surgically removed. For awhile, our lovely girl looked like a pirate, but it didn't phase her. She kept getting sweeter and sweeter, and more trusting. 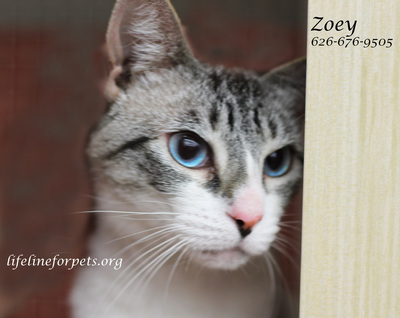 Since she did not especially like to be taken to adoptions, it was difficult for her to be seen, and when she was, she was passed over because she didn't look "perfect." 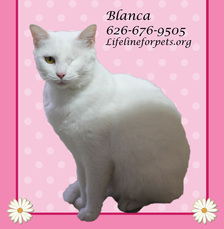 A few years went by, when our Web Manager, for the third time, featured Blanca in our Cat of the Week spot in the weekly local paper. Just by chance, a couple, who never read that paper, happened to stop at a local restaurant for breakfast, and picked up the paper. It was serendipity! They read about her and wanted to help! Long story short: this wonderful couple adopted Blanca, and now Blanca is in a loving, forever home, being pampered as this little trooper truly deserves! Click on a picture to learn about these happy adoptions.